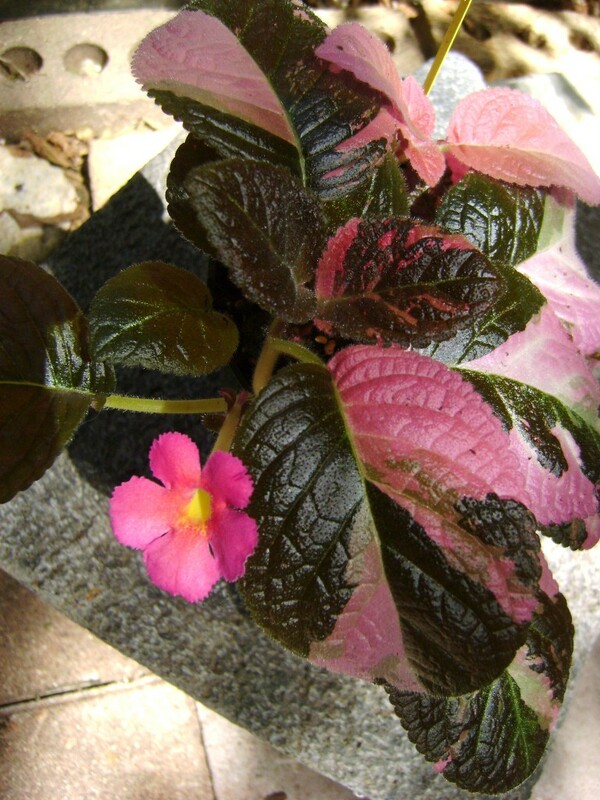 Episcia Ember Lace in Bloom "Beautiful Deep Pink Flower"
Episcia Ember Lace is one of the most beautiful episcias and is one of the most wanted episcias! 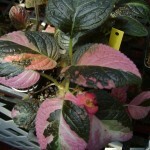 This episcia is an heirloom it was registered in 1958! 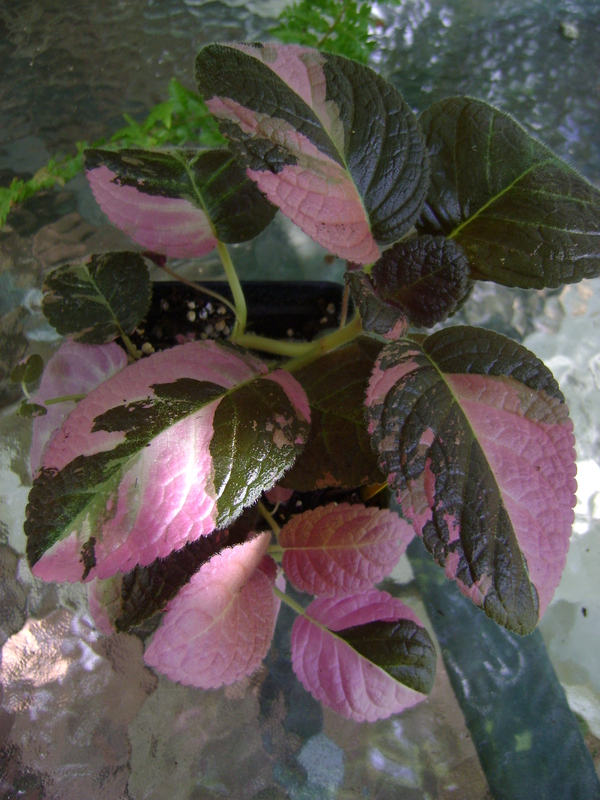 Episcia Ember Lace is a very popular pink and green-leaved cultivar. 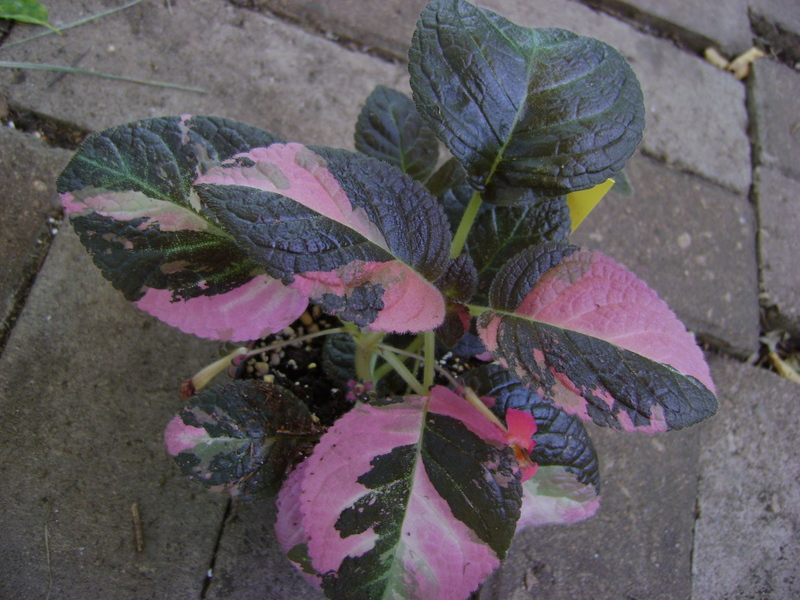 But if you want to keep the pink in it so it wont go back to an all-green form; the crowns and stolons without the variegation must be absolutely removed. I know that sounds brutal but it has to be done! If you decide to purchase Ember Lace someday keep in mind that you have to watch it closely as it grows and as soon as you see a stolon or crown growing with out any pink variegation you must remove it! The very first Ember Lace I purchased started growing solid green stolons and soon most of the crowns lost it’s pink variegation. I was devastated! What in the world did I do wrong. 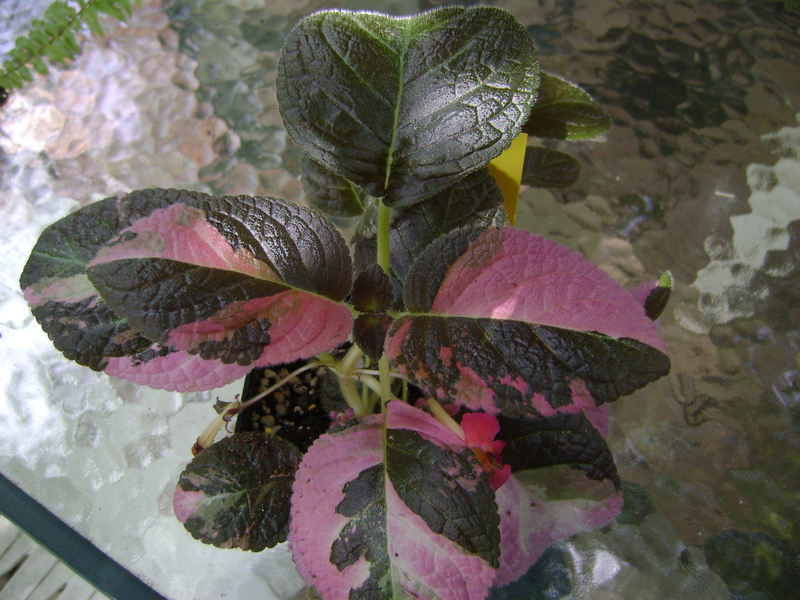 I thought maybe there was some type of special fertilizer I had to use to keep its beautiful pink color so I started looking for information on how to grow this beautiful episcia! I couldn’t find anything! I finally found an article on it in one of the GSN issues. GSN is no longer around. I purchased these issues in 1979 from a neighbor that use to grow African Violets. Thank goodness this issue was all about episcias and episcia Ember lace. I also looked for some information in a book called Exotic Plant Manual. I purchased this book in 1978 when I started growing plants; It didn’t have Ember Lace in it but it did have an Episcia that looked exactly like Ember Lace. The name of that episcia was reptans Lady Lou it says that it was a variegated leaf sport in 1952! 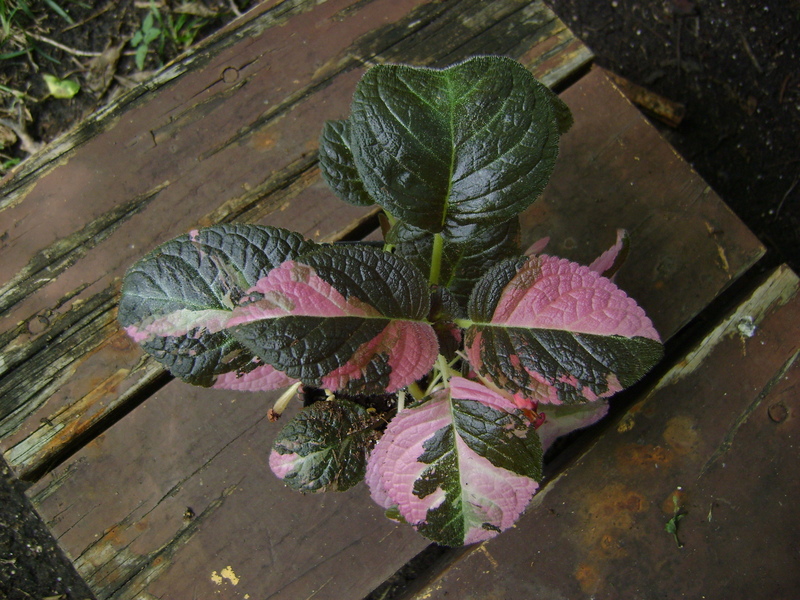 so this episcia was here before Ember Lace!? Episcia Lady Lou also had to be groomed like Ember Lace taking all the solid green growth off or the plant would revert back to green. Episcia Ember Lace is a beautiful episcia! This episcia likes high humidity and bright filtered light. 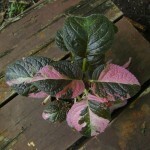 It is mostly grown in terrariums, but I grow my Ember Lave on the patio along with my other episcias. It gets very hot in the summer here in Texas and it seems that my episcias love this heat and the humdity along with it. Most people grow their episcias under lights year round; but I grow my episcias outside on the patio in the spring and summer and I bring them indoors and grow them under lights on plant stands in the winter. Episcias do not like cool temperatures so keep them warm. 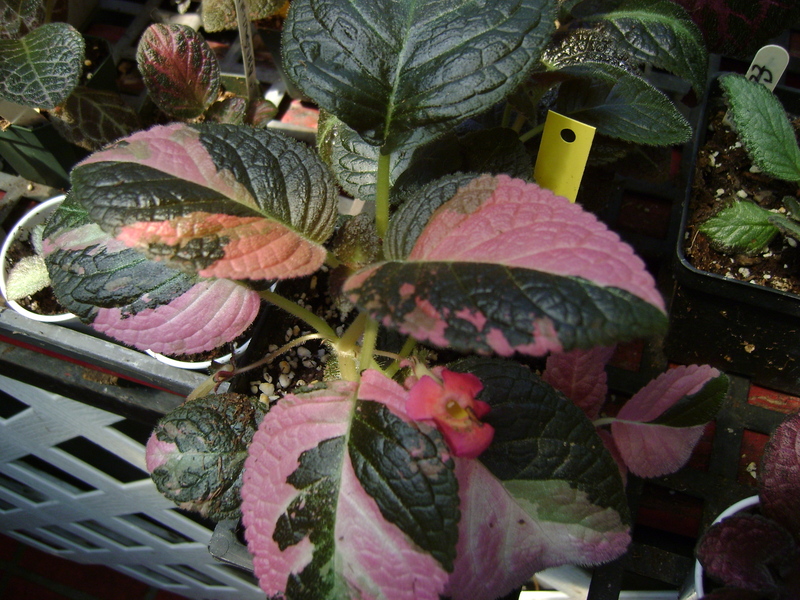 Cold temperature to a episcia is anything below 60 degrees. Episcias can tolerate 100 degree weather thats how hot it gets here in Texas and then some. I fertilize them every time I water in the spring, summer and fall. I do not fertilize during the winter. 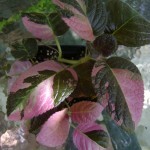 Here are a few pictures of my Episcia Ember Lace. I have already taken 2 stolons off of it and it just keeps on growing. I will try to have some for sale on my website as soon as I can! But all of my friends wont give me a chance to sell any! 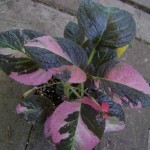 Please give advise and any comments on growing Episcia Ember Lace. I am sure there is more information out there about it and if any one knows where I could find Lady Lou I would greatly appreciate it.